Betty is an actress and freelance writer who lives in Buffalo, New York. She owns three computers and can't tell you the first thing about how they work. Adventuring is her game, where her aggressive tendencies are diffused by snuffing monsters. She used to own a cat. The credits read like the Bible "begats," beginning with the board design copyrighted in 1948 by Selchow & Righter, sifting through a bevy of American and British companies, and ending with Electronic Arts. As you must address all correspondence to the latter, there is no need to bore you with the genealogy of this version of Scrabble. So sue me. Well, the old girl's been with us for 40 years. Happy birthday. Scrabble! You're still the Numero Uno word game in the world. But don't throw away your old Scrabble sets yet, folks. Board games have been known to lose something in electronic translation. Assuming that just about everyone has played Scrabble at one time or another, we'll skip the rules, which are in the manual, and go right to boot. 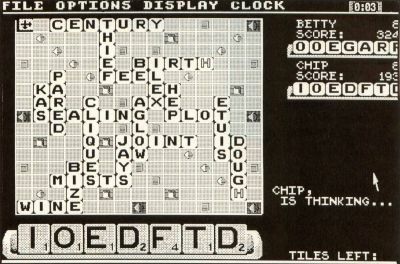 After viewing a really nice title screen, during which a million credits are flashed too fast to read, the familiar Scrabble board unfolds on the left. Very authentic, but lacking the words in the premium squares for an obvious reason: They'd be too small to read. Above are four pulldowns: File, Options, Display and Clock. In the upper right is the clock, showing minutes and seconds. There are eight levels of difficulty—levels 1 through 4 for children and compulsive winners; 5 through 8 for more erudite masochists. All the options of regular Scrabble are here. You may pass, exchange tiles and juggle the letters on your rack. In addition, you may force the computer to stop searching and play the word it is currently considering. You can ask for a hint if you're really stuck, or end the game at any tima Other options include a rundown on the distribution of each letter and a reminder of the value of the pink, blue and red premium squares. The Display menu has three items. "View Thoughts" has a little arrow zipping around the board as the computer ponders its moves. However, once it decides, the move is made in less than a second. If you're not watching carefully, you have to hunt for the word it has played. As the board fills up, this is a real pain, as Mr. Computer dearly loves to tuck strange two-letter words in obscure corners. "View Racks" allows you to see all the racks, which I consider cheating. But, clicked off, your own rack disappears, so that you can't contemplate your own letters without pencil and paper. A definite minus. The third item under Display is "Redraw" to erase unwanted information that won't go away by itself. If you've ever played with slowpokes, you'll appreciate the clock. Choose your move times in increments of half minutes from "Lightning" (30 seconds), to a leisurely five minutes. "Tournament" is two minutes, which is long enough in most cases. Turn the clock off to pause the game or to find a hook for that panting seven-letter word. Cheat, cheat! There is also a save-and-resume game option in case of bedtime. I named my computer opponent "Chip" and challenged him to a best of five. Being an erudite masochist, I chose Level 8, "Tournament" time. I go first with the letters i, i, u, v, u, o, u in my rack. So I cheat and start again. The same letters appear. I cheat again. The same letters appear for the third time! Finally, Chip remembers what "random" means and deals out decent letters. The game begins. Halfway through the second game Chip begins to annoy me. He's challenging perfectly common words like "lobster," "liner," "prone" and "table." Of course, when he asks "Are you sure?" I click on "yes," but inside I'm seething with guilt. Does he believe me? Anyway, his repeated suspicions are holding up the game. Moreover, as he doesn't recognize these words; he's failing to capitalize on the situation by adding an s or other suffix. Therefore the game tilts in my favor. Meanwhile, Chip is slamming his tiles down in a flurry of x, z, v, q and j words that keep me running to the Official Scrabble Dictionary. Sure, they're all there, and even if they weren't, I have no option to challenge him. Just once I catch him playing an illegal word: He adds an s to "kent" which everyone knows is the past tense of "ken." As I'm winning, I merely smile, recognizing that computers are people too. Of course I win, merrily cheating all the way. (For humility's sake I played a couple of games honestly and got creamed.) But there should be more time at the end of a game to rehash the plays. You have about eight seconds to linger over the completed board, then a new board is drawn and that incredible seven-letter "bingo" is gone forever. Up to three can play, with the computer making it four. But picture three scrabbling players crammed around the monitor trying to see, fighting for the mouse, spilling beverages into the surge suppressor and tripping over cords. No thanks. Use the kitchen table. Computer Scrabble knows 23,000 words, yet it doesn't recognize many common ones. There are 100,000 words in the Official Scrabble Dictionary. See what you're missing? As they say, dear Scrabble, you're not getting older, but you're not getting any better, either. How can you improve on perfection?